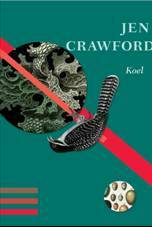 Koel is Jen Crawford’s third poetry collection and it clearly demonstrates the development of a challenging but highly rewarding poetic voice. This is a poet both confident and experimental, who is pushing at the boundaries of place and movement, what is remembered and an immersive present tense, the human subject and the ‘environment’, what we know and what we don’t. In the preface, Crawford suggests: ‘I was looking for gaps to step through, for ways both forward and back’. Koel catapaults the reader through these gaps of uncertainty and possibility. is hearing a cliff-nest boiled in milk. ‘Saccade, saccade’ (25) the poems repeat – like the call of the koel bird, embodying the method of the entire collection. Look here, look here – what can be taken in, what can be interpreted in these jerking movements from one image to another, the frenetic movement between intense points of focus, the crumbling interstice? The nightmarish ‘council of knifebeaks’ (57), reminiscent of the ferocious colonisation of the koel, haunts this liminal space, levering open the suture between body and life, ‘slide whet edges/ for grey lips pink breast, a cut.’ However, there is also the promise of the cycle, the ‘little bubble/ a silver egg/ with a wet chin’ (62), an ‘egg of oscillation’(63) which may yet swing back, if the volcano’s fiery mantle should happen to fall ‘away from you’ (70). Crawford’s poems will take a reader – who is willing to go – to strange and unsettling places. This is certainly poetry at the knife-edge of the experience of the nomadic human animal. Dr Rose Lucas is a Melbourne poet. Her two collections, Even in the Dark (2013) and Unexpected Clearing (2016) were published by UWAP. She is currently completing her third collection, At the Point of Seeing. She teaches in the Graduate Research area at Victoria University.